I am a very picky eater, but I love food and will try new things at least once. One of my favorite types of food is barbecue. I think my Dad is a grill master. So, when it comes to barbecue, I hate to be disappointed. During my mini getaway to Miami, my friend, Aerial, brought me to Carolina Joe’s Barbecue after her step-dad recommended we go there. She was just as worried as I was in regard to me enjoying my meal. Well, I stepped to the counter and ordered the BBQ Chicken Dinner that came with yellow or white rice and two sides. Without hesitation, I chose yellow rice, mac-n-cheese and baked beans. 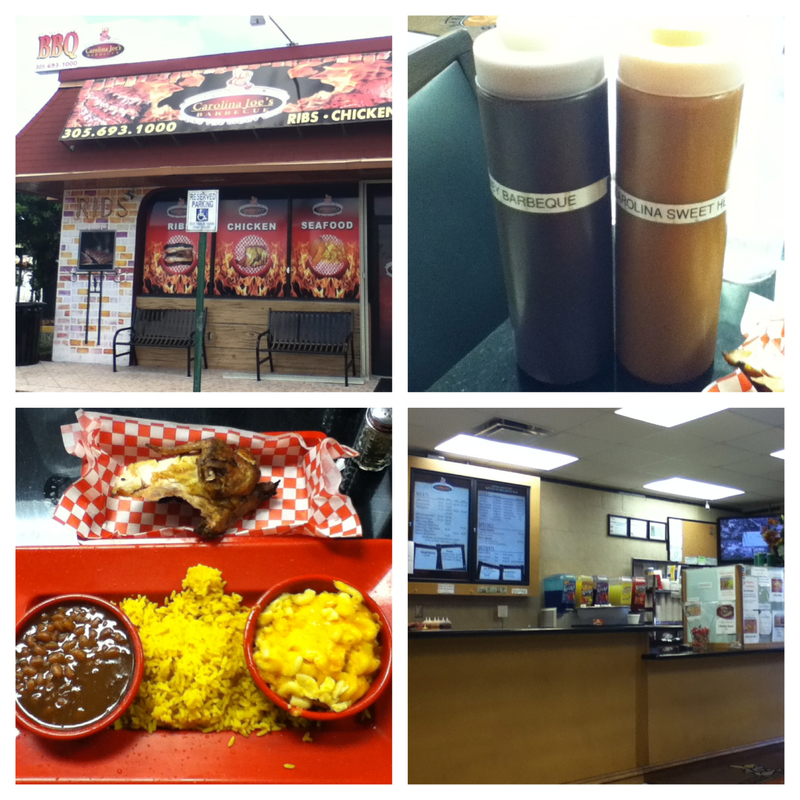 I also had a choice of BBQ sauce, a regular BBQ sauce or Carolina Joe’s Sweet Hot Sauce. I ordered the quarter white BBQ chicken. The BBQ flavor was subtle, but after applying the Carolina Joe’s Sweet Hot Sauce, it became quite distinct. I would describe the Carolina Joe’s Sweet Hot Sauce as having a honey mustard-BBQ-hot sauce flavor. It was very good! The yellow rice was cooked to perfection. The baked beans were sweet and full of flavor. While, I’m used to my mother’s awesome mac-n-cheese, this dish definitely had flare. It was well-seasoned and had an ample amount of cheese. In regard to the service I received, the young lady at the counter was helpful and gave her truthful opinion on menu items. As you can see in the picture, there is a counter where you place your order. Dining-in is an option, but do not expect a full-service restaurant. Your food is brought to the table and that is the extent of it. For anyone traveling to Miami and in need of a restaurant recommendation, I would most certainly recommend Carolina Joe’s Barbecue. Posted on Sat.Jun.02.2012, in Bon Appetit and tagged BBQ, Carolina Joe's Barbecue, Dining out, eating out, food, Miami, recommend, Restaurant, review. Bookmark the permalink. 2 Comments. Wow I’m a picky eater too. But the food looks good! Reminds of a bbq place I went to outside of Ft. Lauderdale. Yes, I know! It was good and Aerial said she really enjoyed her fried mahi mahi.